We bought our first 2 of these bean bags when my kids were 3 and 5 (for Christmas 6 years ago! ), we had another kiddo and bought a 3rd bean bag a couple years later. We all use them every single day for reading, watching movies, whatever. They have held up well in the washing machine when needed. We've refilled once, all 3 are needing some more filling now. Thanks for a great quality product. They still love them after 2 years! We purchased two kids bean bag chairs two years ago and they still love them! They are now 4 1/2 and 7. They were excited to create the perfect reading corner with their bean bag chairs after taking down this year's Christmas tree. They wash beautifully and hold up under lots of jumping, dragging and sitting. We have had a 37" for almost 3 years and it is very well loved by all four of our girls! The filler compressed to about half, but the chair is still comfy. I do plan to order more filler soon, just so it's not so low to the ground. We've got one each of the Citrus and Cocoa "Bubbly Cotton" bags and can't believe how well they've held up for the past four years through four kids using them daily, dragging them around, and jumping on them. Highly recommended to many friends. Great product and fantastic service. Bought this 3 or 4 years ago now and looks like new, even though my daughter constantly jumps on it, dives into it, and opens it up and crawls around inside it. Highly recommend! Best gift ever from Grandparents! 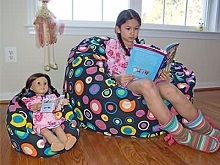 We purchased this beanbag for one of our granddaughters several years ago and have purchased beanbags for two more since. They use them all the time, not always gently either.! The covers have been washed and they have been refilled several times and they are still good as new. We have another grandchild on the way and will surely be ordering another beanbag soon. Ordered this for my then 14 month old grand daughter December 2013. A bit pricey but I am willing to pay for made in usa. As it turns out it is very well made. The cotton cover is tough and very durable but very soft to the touch. Was happy to discover that the inner bean bag is equipped with the child safe lock zipper. I am ready to order some filler to fluff it up. I would definitely recommend this product to anyone and would purchase another here. I bought the chair to create a fabulous reading nook. It is simply a great bean bag chair. My daughter loves it . And washable?!? Just an incredible chair. We have owned 2 of these chairs for at least 4 years. They are used daily and still look great. I love that they are washable. I would absolutely recommend them. My three children received these as gifts for Christmas 3 years ago. They have been a huge hit with the whole family and get a TON of use. The fabric is truly still like new and I believe the testimonials that state they've had them for years and expect to have them for many more. Attractive , sturdy fabrics and superbly made, I would recommend these to anyone. I recently purchased a 3rd beanbag from AHH! These are the best...comfort level, quality, customer service, & more. All 3 of my kids have one now, including a tiny one for my youngest daughters doll! You can't go wrong ordering from here! Used daily by my young boys - wonderful quality! We bought these last Christmas for our sons, then ages 4 and 6. The idea was to save our couches from getting rearranged into "nests" all the time and give them a place to snuggle up. WOW - we have all used them so much! EVERY single night we sit and read in them before bed. As I write this, my husband is sitting in one in front of the fireplace! We love these beanbags. I am placing my order right now for one more - my 2 year old wants his own bean bag! Thank you for such great quality. Love the washable bags and liners!! The best!! Saw them at another library and came right back and bought for my library. I'm the library manager. They're great, used constantly, held up, great colors, love these beanbags! We have had our bean bag for close to 10 years and still love it. My kids and their friends sometimes use it as a landing pad and it holds up perfectly. Besides having to refill a few times over the years it still looks new. Absolutely 100% worth the money! We need to get another "Bubbly" bean bag because we left our other one at our beach house. We have a special needs daughter and it's where she likes to sit everyday. Regretfully, I don't have enough time to personalize it this time - Thanks for shipping it as soon as possible - we are scrambling for another one! Thank you for such wonderful products. We have four little kids, and these bean bags just rock. I purchased two of your bean bags last year for Christmas gifts for my two kids - they LOVE them, and so do I. "Santa" got the "Let's Play" for my son and the "bubbly" style for my daughter. Thank you so much!! We absolutely love the design, quality and comfort!!! The kids love their new bean bag chair. It is really full when it arrives but does get more comfortable after use or kids jumping on it. The bag conforms to the body, holding you up for a comfy place to sit. Thanks.